I explained to the athletes how important it is to capitalize on summer race efforts not just for the sheer fitness gains but because it’s an opportunity to practice our race preparation skills, which are often neglected in the summer. The town of Lake Placid in upstate NY is a cross-country skiers dream town. Site of the 1980 Olympics there is a winter sports feel to the community that is undeniable, not to mention more quality rollerskiing and trail running than a Nordie could hope for. 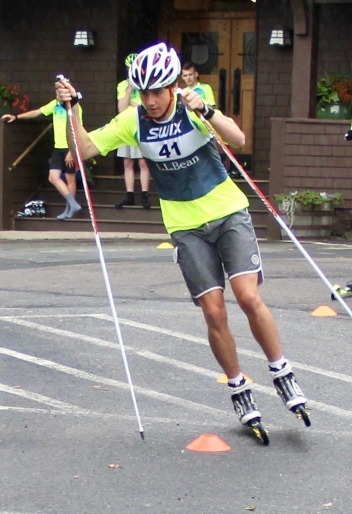 I was super excited to make it back to Lake Placid for the New England REG camp. Some REG’s are bigger than others, but this year the New England REG was BIG. Around 50 athletes ranging from soon to be collegiate skiers to under 16 year old up-and-comers. For me this is super motivating to see so that many young skiers are choosing to attend their REG and focus on elite level ski training in the middle of the summer. 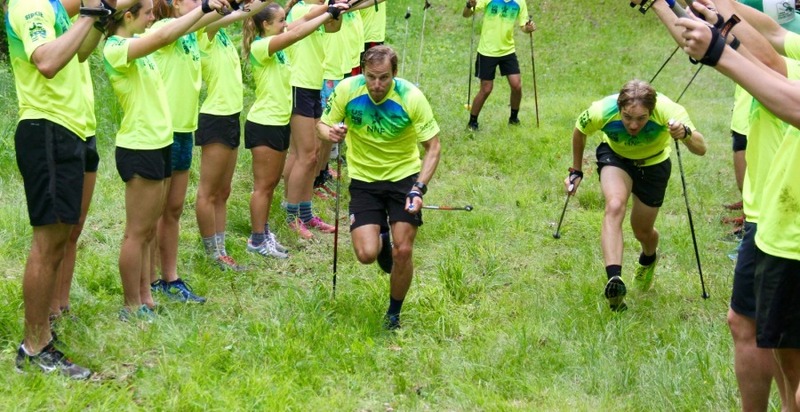 In addition to some big group workouts the goal of many of these athletes is to compete well in the double-pole test, agility course, and uphill run in order to punch their ticket to October NEG training camp. Even with a few tests scheduled for the campers, given the time of year we still wanted to keep the volume pretty high. I was stoked to hear that during this REG some skiers trained more than they ever had before in a week while having hard efforts and making improvements on their technique. With some epic point-to-point rollerskis on that buttery New York pavement there were so many memorable workouts during camp. For me maybe the most memorable however was the uphill run test at Whiteface Mountain. I don’t mind uphill running but definitely don’t look forward to it, thankfully this made for a great talking point with the athletes about why we do summer time trials such as the uphill run. I explained to the athletes how important it is to capitalize on summer race efforts not just for the sheer fitness gains but because it’s an opportunity to practice our race preparation skills, which are often neglected in the summer. To me it doesn’t matter if an athlete is the fastest or slowest in the group running up the mountain but if they execute a race plan and stay mentally tough than it was a successful day. This means making sure they get a good dinner and breakfast in before the race, visualize their race plan and performance, practice a thought out warm-up before the start, and use positive self talk to get through what is by far one of the most uncomfortable workouts of the summer. I was supper happy with the response from the group and enjoying explaining to the kids that taking into account all of these pre-race details does not mean an athlete is taking the time trail too seriously, simply just being professional and we can all do that light heartedly and have fun at the same time. With 50 kids about to hammer three quarters of the way up Whiteface Mountain I certainly wasn’t going to sit out the race so I grabbed a bib and jumped in. As I’ve mentioned before it’s such a fun and unique feeling to work as an athlete/coach at these camps and experience each workout side by side with the athletes. We build a fun bond and mutual respect for one another that makes for such a productive coaching experiences. Can’t wait for the next camp in LP, National U16!